The conventional boxing stance has changed throughout history from era to era. 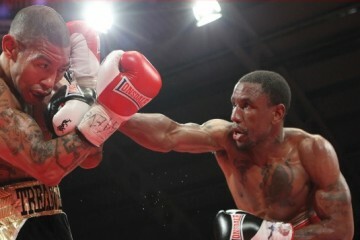 In modern boxing, the typical boxing stance has adopted an approach that combines offense with defense. Different boxers adopt different stances depending on their style and ability, but they’re not always the most fundamentally sound. I’ll be going through the most widely used form and the benefits of it. Regardless of whether you’re an orthodox or southpaw, it’ll be the same but just mirrored instead. If you want to learn all the boxing fundamentals, I recommend the How to Box in 10 Days course, which takes you step-by-step through boxing basics. Please note: The following points are made assuming you and your opponent are adopting the same stance (e.g. orthodox vs orthodox or southpaw vs southpaw). Chin Down: Your chin should be kept down towards your chest and not sticking out. Rear Hand Guarding Chin (1): Keep your rear hand guarding the outside of your chin at all times. Your rear guard will be responsible for parrying jabs and blocking your opponent’s lead hook. Lead Hand Around 6 Inches From Chin (2): Your lead had should be held at around 6-8 inches from your chin and aligned just below. Having it at this position won’t obscure your vision and allows you to throw fast jabs, quickly block your opponent’s rear hand and parry jabs and crosses to the body. Elbows Tucked In (3): Your rear elbow should always be tucked in to block your opponent’s rear hook to the body. Naturally, if you hold your lead hand 6-8 inches from your chin, your lead elbow should be a few inches from the outside of your body, which allows you to quickly tuck it in when necessary. Stand Sideways Slightly: You should be in a position where your entire chest is not directly facing your opponent. This means that you’re too squared up. Instead, you must stand slightly at a sideways angle so there is less target for your opponent. Knees Bent (1): Your knees should always be bent slightly to give your entire body support and to produce power. 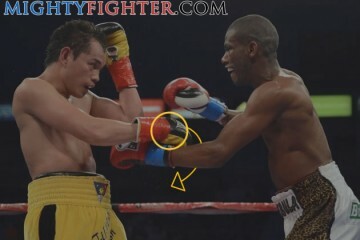 You should still be able to bend them even more if you need to avoid incoming punches. Feet Spread Just Past Shoulder Width (2): Your feet should be spread apart so that they’re a few inches past the outside of your shoulder width. Foot Positioning: Your lead foot should be at a 10-15 degree angle while your rear foot should be positioned at an angle of around 45 degrees. Heel of Rear Foot Lifted (3): Stand on the balls of your rear foot and lift the heel slightly. This allows you to move around quicker whether for offense or defense. Lead Foot Planted: Your lead foot should be firmly planted and flat on the surface. Keep Weight Centered: Your weight should be evening distributed between your front and back legs. When you’re approaching your opponent, you may want to lean forward very slightly so more weight is put on your front foot, which enables you to attack a bit quicker. Positioning and Mobility: This stance allows you to quickly get into position to attack as well as get into a defensive posture when necessary. Not just with your arms, but also with your foot movement. This is only made possible because of the effective positioning of the different elements of your upper and lower body. Power: Not only are you able to quickly fire punches from this stance, but it’ll also enable you to throw punches with extra power. To learn the correct techniques to increase your punching power, you should read the How To Punch Harder article. Balance: If your stance is poor, then you can go down from the slightest punch or push. Fortunately, adopting this stance will give you stability so you’re less likely to be knocked off balance whether you get hit or you miss a punch. 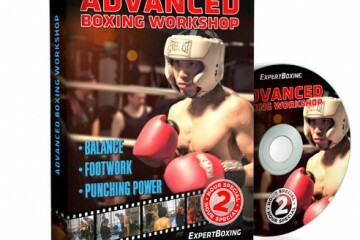 I recommend the How to Box in 10 Days course which shows you step-by-step boxing fundamentals. Stand With Your Feet Too Wide Apart: You can easily be knocked off balance. Stand With Your Feet Too Square: Not only can you get knocked off balance easily, but you’re also offering up a bigger target to your opponent. Feet in a Straight Line: Don’t stand in a straight line, as if you’re standing on a tightrope. Your feet should maintain a good distance apart (few inches outside your shoulder width). Pointing Both Feet Forward: The toes of both your feet should be positioned at an angle (see above) and not pointed straight forward towards your opponent. Lean Too Far Forward or Backwards: Putting too much weight on your front or back foot hinders your offensive/defensive movement and power. Standing up Too Straight: Your legs and spine shouldn’t be completely straight, it should always be bent forward very slightly. Standing Too Sideways: You may think that standing completely to the side offers less of a target to your opponent, but while this is true, you’re completely taking your rear hand out of the picture. Lead Hand Too Low: You’ll see that nearly all fighters drop their lead head from time to time for different reasons. It’s OK to do it as long as it’s intended as a feint or a decoy, but not if it’s out of bad habits. Dropping Rear Guard: No matter what, keep your rear hand up and if you throw a punch with your rear hand, make sure you bring it back into position. The last thing you want is to get caught by a counter lead hook that you didn’t see coming. 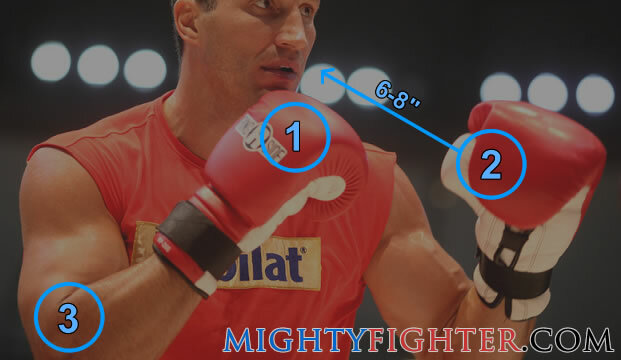 This conventional boxing stance is taught in boxing gyms throughout the world and for good reason. Make a habit out of perfecting this stance first, and when you’re more experienced, you’ll likely add various elements to your own stance. 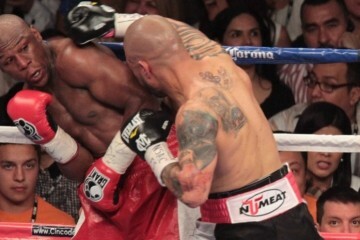 Versatile and talented boxers such as Floyd Mayweather Jr and Andre Dirrell will often adopt various stances. You may also decide to switch up your stance to confuse your opponent, but ultimately, remember not to pick up bad habits along the way.